Oh! Hi everybody, Truffles here! You caught me reading Mommy's Kindle :) I have to sneak moments with it here and there because she always has it with her! What am I reading? I'm so glad you asked! I'm reading Ghostly Paws, the first book in the Mystic Notch Cozy Mystery Series by Leighann Dobbs. You'll never guess who has a guest role in the book.....ME!!!! That's right, awhile back Leighann messaged Mommy on Facebook to let her know that in her latest book there is a gang of cats that play a small role and one is a tortie that she named Truffles in honor of moi! Pandora here, the fantastic feline from Ghostly Paws, the first book in the Mystic Notch Cozy Mystery Series featuring magic, mystery and of course, cats. I thought I’d take a break from trying to keep my human out of trouble and tell you a little bit about Mystic Notch. Mystic Notch is small, but then again aren’t most towns nestled in New Hampshire’s White Mountains small? It does have one thing the other towns don’t though ... magic. Yep, Mystic Notch has had magic since way back. Of course, most of the humans have forgotten all about the magic. And that's how my new human Willa, gets into trouble. I inherited Willa when her grandma passed over to the other side and, well, I must say she’s been a little hard to train. I’m paws-itive I can get her trained eventually but right now she’s a little rough around the edges. I suppose it’s not her fault, being an inferior species and all. The truth is humans simply don’t have the finely tuned senses that cats do, and when Willa is haunted by the town librarian’s ghost who wants help finding her killer, her senses aren’t honed to follow the right trail. ... and that’s where I come in. It’s me-ow that helps steer Willa in the right direction. Which isn’t easy because she just doesn’t seem to understand a thing I am trying to tell her. Willa tries to figure things out on her own aided by a quirky cast of characters including the twin octogenarians Hattie and Cordelia, a retired magician, the old town postmaster and Willa’s best friend who makes noxious backfiring potions. And then there’s the handsome Sheriff Eddie Striker. Now there’s someone I could really flick my tail for. He’d be purr-fect for Willa too ... if only she’d just just see that for herself, I think she’d be much happier. 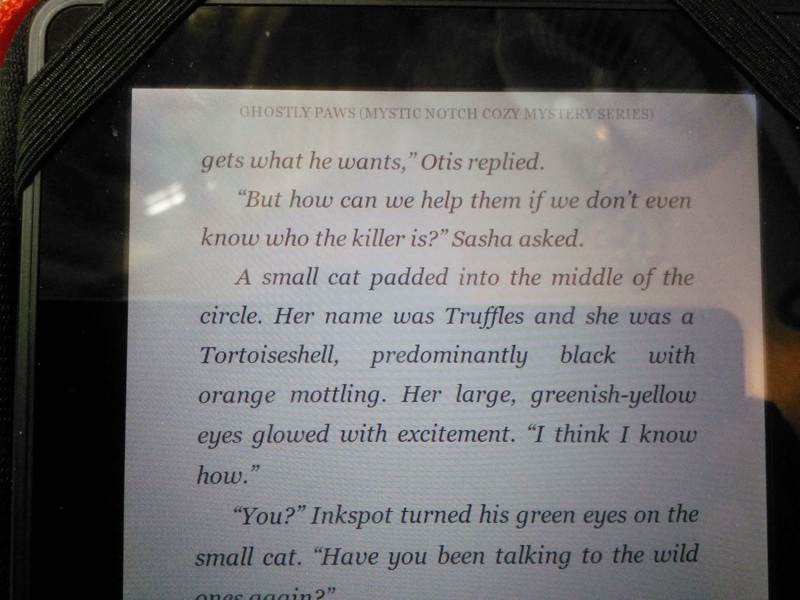 But that’s neither here nor there, the fact is that Willa holds the key to saving Mystic Notch and, as usual, we cats are the only ones that can see the real reason the librarian was murdered. As usual we come to her aid in the end, but hardly get any credit! Ahh, but I must go, time for my nap. If you see the book, you really must get your paws on it and if you want to talk further, you can usually find me curled up in the window of Willa’s bookstore, Devine Used and Rare Books located right in the heart of Mystic Notch. P.S. Did I mention there was magic, cats and ghosts? and me-ow? 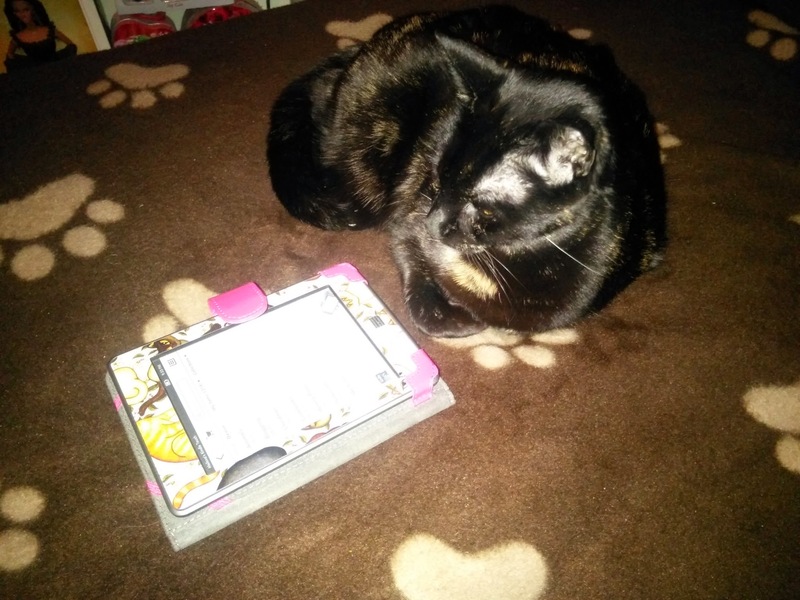 Mochas, Mysteries and Meows Review: This first book in Leighann Dobbs' Mystic Notch Mystery Series is the quintessential New England/paranormal/cat cozy. It's set in a small town I would love to inhabit and filled with characters - both human and feline - I would be happy to call my friends. Willa has survived a divorce and a car accident which left her with the ability to see ghosts. Since inheriting her grandmother's Victorian home, bookshop, and cat Pandora in her hometown of Mystic Notch, New Hampshire, things are looking up for Willa. Then early one morning on the way to the bookshop she and Pandora investigate the library's door mysteriously left open, and stumble upon elderly librarian Lavinia dead at the foot of the stairs. Lavinia's ghost asks Willa to solve her murder. There's more to Mystic Notch than meets the eye - including a scene stealing colony of feral cats and an aura of mystery and magic that permeates the town. Favorite characters include Willa's BFF Pepper who makes magical herbal teas with sometimes hysterical repercussions, and a group of elderlee "regulars" who have coffee at the bookshop each morning. And a local family named Bates live in a gothic mansion that reminds me of Bates Motel! I was positive I knew the identity of the killer early on and was pleasantly surprised to be proven completely wrong! The ending perfectly sets up many future adventures for Willa and Pandora and they can't come fast enough for this reader! That is so cool. Well done Truffles of the greenish-yellow eyes! I am so honored to follow a famous feline! Well done Truffles! Oh, Wow!! A literary cameo! That is SOOOO cool! - Crepes. Whoa! You can’t get much cooler than that. Wow, that is so pawesome, Truffles! Can we say that we know a celebricat?!? How exciting for you Truffles!!! And what a great series...New England, mystery, paranormal and cats! I have to read this series! Truffles, you've been IMMORTALIZED! way waaaaay cool!! Oh wow!!! thats cooL!!!! Good for you!!! SOunds like a PAWsome book! Thanks for linking up to the Pet parade with us!